I’m a Shopaholic. How Can I Stop Over-Spending? If we’re honest with ourselves, many of us will admit that so much of what we spend money on – and why we spend money – is tied to our emotional state. Sometimes we spend money completely on a whim because something struck us a being a “must have” item in that moment. Later, that item simply hangs in our closet or collects dust around the house. At other times, our purchasing decisions are wrapped up in the way we feel overall – and it may be a sentiment we’ve been carrying around for weeks. As a result, we spend money for a host of reasons: out of boredom, depression, elation, or angst, to name just a few emotions. Do You Often Tell Yourself “I Deserve It”? We also shop to reinforce our egos, to impress others, or simply because we feel like we “deserve it.” The important point is to recognize when such emotional spending puts you in the red. What good is it to “feel like a million bucks” on the outside, simply because you have the external trappings or appearance of success – but on the inside you’re really a wreck about your finances? This is what emotional spending does. It makes you feel guilty about your purchases, and it sets you back financially. Especially among women, too many of us shop as a way to feel better. It’s easy to engage in “retail therapy” if you’re angry, depressed, frustrated about something – or even happy. But going on an emotional spending binge is just as dangerous as going on a drinking binge: You may get a short-term sense of euphoria, but any emotional boost you experience will quickly give way to renewed feelings of guilt and despair. Moreover, you’ll face the ultimate shopper’s hangover: credit card bills that take months to pay off. As a matter of practice, leave your credit cards at home more often than not. Having credit cards, charge cards and retail department store cards in your wallet or purse makes it easy to make spur-of-the-moment shopping trips. You’ll think more about your spending practices if you have to part with your hard-earned dollars, versus just whipping out a credit card. Plus, people tend to spend more when they use plastic, instead of cash. When you see something expensive that you think you “must” have. For an unplanned purchase, be willing to wait for just one day, and tell yourself that if you still really want the item, you can always go back and get it the next day. In many cases, that 24-hour cooling off period will be just the break you need to not indulge. For most shopaholics, it’s fruitless to simply say “Just don’t shop!” If it was that easy, no one would have a shopping problem. The real issue isn’t shopping, in and of itself. The real issue is excessive shopping, or compulsive, habitual, out-of-control shopping. Sometimes it happens at certain periods, like during the holidays. To combat the emergence of the problem, and keep your finances in tact, give yourself permission to do some shopping – within reason. Set a realistic budget, namely a monthly amount of money that you can spend, without racking up debt and without harming your personal finances. Once you hit your limit, do everything in your power to stop shopping for the rest of the month. When you go on a shopping excursion, take a buddy shopping with you who will not let you go overboard. That friend should know your budget or your spending limit for that particular outing. Then it’s the friend’s job to get you out of the mall or away from the stores once you hit your limit. Also, tell any supportive or positive family and friends you have that you’re working on curbing your spending, and ask for their help and encouragement in helping you meet your goal. Be aware of your emotional state at all times, and make a pledge that you will not shop when your emotional state is off kilter. This means forgoing shopping trips when you feel any kind of emotional extreme – like elation, sadness or depression. Instead, if you must shop, do so during “emotion neutral” times, i.e., when you’re on a relatively even emotional keel. Find alternative things to do to replace your shopping trips. Instead of hitting your favorite stores, or shopping only, channel your energy into more positive activities like exercising, reading or pursuing a hobby. If you’re busy, especially if you’re doing something fun and physical (tennis anyone? ), you’ll not only be too occupied to do mindless shopping, you’ll also be engaged in a healthy, stress-busting activity. You can also get a handle on your impulse shopping binges by preventing them in the first place – or learning why your spending is out of control. Start using a journal. Write down what happens in your life and look for patterns to see if there is something that often serves as a “trigger” event that makes you want to shop. Also, spend some time reflecting about your past. Write down notes about when you first became a shopaholic, how shopping makes you feel, and what ramifications and emotions you experience before, during and after you shop. Lastly, for serious shopaholics, try joining a support group, such as The Stopping Overshopping Program (www.StoppingOvershopping.com), created by April Lane Benson, Ph.D., the author of I Shop, Therefore I Am: Compulsive Buying and the Search for Self. Benson has been in private practice in New York City for nearly 30 years and has treated many women who are excessive shoppers. Dr. Benson’s program is available to New Yorkers, in person, for individuals, couples and groups. A similar program, is offered by psychotherapist Olivia Mellan, the author of Overcoming Overspending. 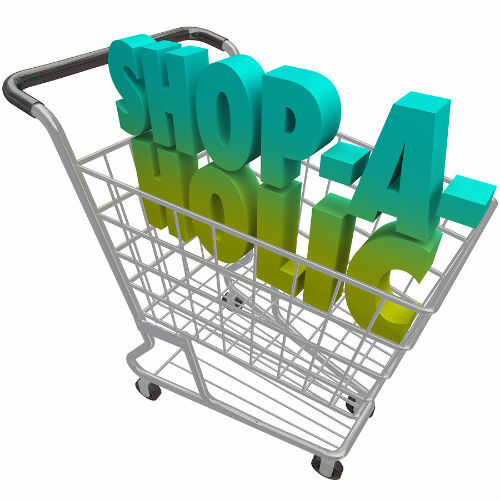 She has teleclasses, CDs, books and online resources on her website (www.MoneyHarmony.com) to help shopaholics. By getting to the root of why you consistently splurge, you’ll understand how your habits first began and how to combat the cultural and media influences that make you want to hit the mall and shop unnecessarily or in excess. Advertising Disclosure: This site may accept advertising, affiliate payments or other forms of compensation from companies mentioned in articles. This compensation may impact how and where products and companies appear on this site. All information on this blog is for educational purposes only. Lynnette Khalfani-Cox, The Money Coach, is not a certified financial planner, registered investment adviser, or attorney. If you need specialty financial, investment or legal advice, please consult the appropriate professional. Advertising Disclosure: This site may accept advertising, affiliate payments or other forms of compensation from companies mentioned in articles. This compensation may impact how and where products and companies appear on this site. AskTheMoneyCoach™ and Lynnette Khalfani-Cox, The Money Coach® are trademarks of TheMoneyCoach.net, LLC.